Essential Nutrient for Emotional, Physical & Spiritual Health: Vitamin N (Nature) – Glass Half Full with Leslie Krongold, Ed.D. What is Nature and how is it beneficial to our emotional, physical, and spiritual well-being? Bonnie Lewkowicz (Program Manager, Access Northern California) and Lori Gray (Adventures & Outings Program Coordinator) both work for the Bay Area Outreach & Recreation Program (BORP) organization in Berkeley, California. Bonnie, Lori, and Delroy share their love of nature in this podcast episode. Both women use wheelchairs and have years of experience navigating hiking trails and organizing outdoor adventures for people with physical and/or developmental disabilities. Joining them is middle school teacher, Delroy Thompson, in South Florida. Together they share how important nature is for them. 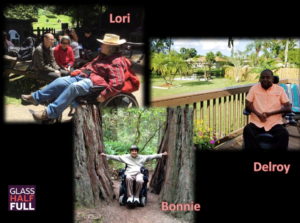 Bonnie wrote A Wheelchair Rider’s Guide published by the Coastal Conservancy. Delroy, is a member of the Muscular Dystrophy Association National Community Advisory Committee, and wrote a children’s book, The Secret of the Elves in Helen, about an elf kingdom n the Blue Ridge Mountains. Not everyone is fortunate enough to attend BORP events but you can search for similar organizations in your area at the National Center on Health, Physical Activity and Disability (NCHPAD) website.